In terms of value, the global povidone iodine market is expected to expand at a CAGR of 5.2% from 2018 to 2026, according to a new research report titled ‘Povidone Iodine Market – Global Industry Analysis, Value, Share, Growth, Trends, and Forecast, 2018–2026’ published by Transparency Market Research (TMR) In terms of value, the global povidone iodine market is anticipated to reach US$ 232,756.0 thousand by 2026. The market is driven by the increase in demand for antiseptic and disinfectant products. North America held major share of the global povidone iodine market in 2017. 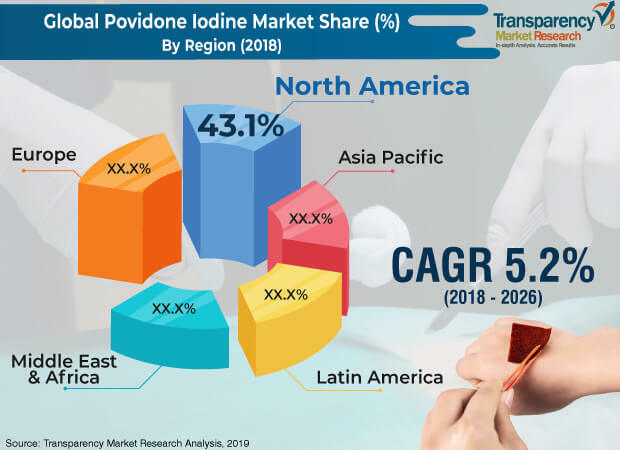 However, the povidone iodine market in Asia Pacific is estimated to expand at a faster pace during the forecast period, led by the expansion in the health care sector due to public and private funding. Based on application, the skin sterilization segment held prominent share of the global povidone iodine market in 2017. Based on application, the skin sterilization segment accounted for large share of the povidone iodine market in terms of value and volume in 2017. This can be ascribed to the increase in demand for povidone iodine in applications such as disinfectants and antiseptics. Povidone iodine-based antiseptics and disinfectants possess better performance properties than alternatives. They provide improved antimicrobial action on a wide range of microorganisms. They can also be effectively employed in the treatment of infections in wounds; cuts; burns; ulcers such as decubitus ulcers and stasis ulcers; and diabetic wounds. Furthermore, demand for veterinary antiseptics is rising in various animal care products due to their mild sensation and excellent antimicrobial efficacy. Increase in adoption of pet animals, primarily in emerging economies, due to improvement in lifestyle and economic development is boosting the demand for animal health care products such as veterinary shampoos and antiseptics. This, in turn, is estimated to drive the povidone iodine market during the forecast period. Povidone iodine-based antiseptics and disinfectants have shorter period of action compared to their close substitutes such as chlorhexidine alcohol and sodium hypochlorite. These substitutes are preferred in long action applications such as catheter insertion, skin preparation for surgery, and hand wash before surgery. Thus, less efficacy of povidone iodine in certain cleansing applications is estimated to hamper the povidone iodine market during the forecast period. Bacterial infections can lead to labor and puerperium complications during childbirth. This accounts for around 10% of maternal mortality. Vaginal infections are considered key reasons for high maternal mortality. Furthermore, maternal infections around childbirth have significant impact on newborn mortality. The World Health Organization (WHO) has recommended the use of povidone iodine in vaginal cleansing before the cesarean section. The use of povidone iodine minimizes the discomfort compared to other alternatives. The maternal mortality rate is high in developing nations. Infections acquired during or following childbirth can also cause long-term disabilities such as chronic pelvic pain, fallopian tube blockage, and secondary infertility. The use of povidone iodine for vaginal cleansing can also prevent gynecological problems. Thus, rise in usage of povidone iodine in vaginal cleansing applications is estimated to boost the povidone iodine market in the near future. North America was the major region of the global povidone iodine market, accounting for more than 35% share in terms of volume and value in 2017. Demand for povidone iodine-based antiseptics and disinfectants has been rising due to their improved antimicrobial action that helps significantly reduce the risk of infections. Hospital-acquired infections (HAIs) is a major reason for deaths in the U.S. It has propelled the demand for effective antiseptics and disinfectants in the country. This, in turn, is projected to drive the demand for povidone iodine in North America owing to its improved results compared to alternatives. Furthermore, regulatory bodies such as the Food and Drug Administration (FDA) and Centers for Disease Control and prevention (CDC) have implemented stringent regulations on surgical hand antiseptics. Povidone iodine is employed in surgical hand antiseptics owing to its excellent efficacy against microorganisms. This is likely to fuel the povidone iodine market in North America during the forecast period. The global povidone iodine is fragmented; large numbers of local and international players operate in the market. Key players include Glide Chem Private Limited, Adani Pharmachem Private Limited, Boai NKY Pharmaceuticals Ltd, Lasa Supergenerics Limited, Medline Industries, Inc, R.N. LABORATORIES PVT. LTD., BASF SE, Samrat Pharmachem Limited, SHANGHAI YUKING WATER SOLUBLE MATERIAL TECH CO.,LTD., Avrio Health L.P., Huangshan Bonsun Pharmaceuticals Co.,Ltd., NIPPON SHOKUBAI CO., LTD, Vishal Laboratories, Zhangzhou Huafu Chemical Co., Ltd., and JH Nanhang Life Sciences Co.,Ltd. Market players have been profiled in terms of attributes such as company overview, financial overview, business strategies, and recent developments. The report comprises a matrix of comparison between the top two players operating in the global povidone iodine market along with analysis of their key strengths for 2017.